I'm very pleased to be welcoming Sadie from A Life In The English Rain to the blog today. I've been following Sadie's blog for a couple of years now and am always inspired by her simple yet beautiful creations, which all fit so well into her gorgeous home. If you are not familiar with her blog, please pop on over and take a look, you won't be disappointed. I'm sure you will also love what she has prepared for us today. It's that time of year again. Halloween is sneaking up behind us, ready to jump out and shout 'Boo'! Do you decorate? Well, if the answer is a resounding no, because you don't like all the garish colours and tackiness of the whole affair, then it need not be that way. Keep it simple, and keep it elegant. A touch of Halloween here and there is just as effective as a house decorated head to toe in fake cobweb. 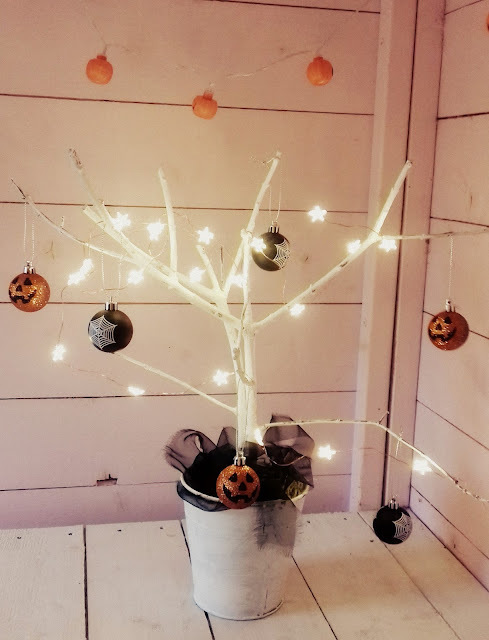 A Halloween tree is so simple. It also has the added bonus of being easily changed for any other seasonal celebration. I'll let you into a secret, and tell you, this is actually my Easter tree. A few alterations and you'd never know. Take a few twigs, and secure in a pot. I used air drying clay to hold the twigs in place. Once the clay had dried, I added some decorative stones to the top to cover it, and add extra weight. The twigs had been painted white, but of course, you can paint them any colour. Black would be perfect for Halloween. A strand of battery operated lights is an optional extra, but it does take it up a level. I found the baubles in a supermarket, but have to say I'd never seen them before, or since. But you could easily make your own. A few unloved Christmas baubles spray painted and decorated with glittery pumpkin faces would be quick and easy to do. Hang them from the branches, add some black sheer fabric around the base, and it's done. 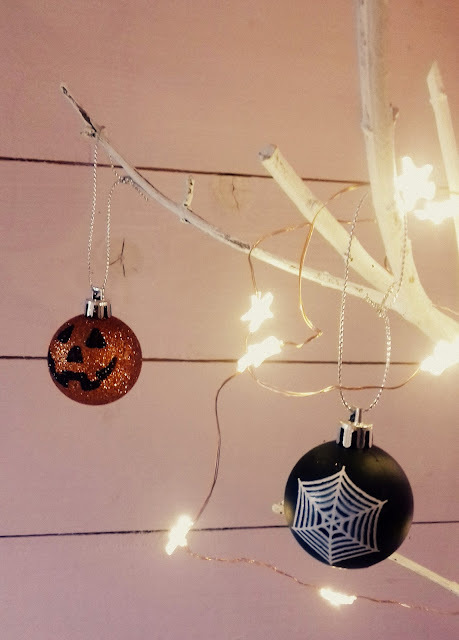 An inexpensive, simple, and elegant nod to Halloween. Huge thanks to Sadie for popping over to share with us her beautiful Halloween tree. It just goes to show that Halloween can be pretty too. Don't forget you can hear more from Sadie over at her own blog A Life In The English Rain. I have an Easter tree so very similar to yours so great to use it for other occasions. It looks impressive for Halloween. Great to see Sadie over here in good old Essex! This reminds me am I too late to get out my Halloween decorations! !